The Irish slave trade began in 1625 when King James II proclaimed that 30,000 Irish prisoners be sent overseas and sold to English settlers in the West Indies, where there was a shortage of manual labor. Puritan Oliver Cromwell, Lord Protector of England took power in 1653, after the English Civil War, and took revenge on the Irish for supporting the crown by increasing deportation to Barbados, Jamaica, and other parts of the West Indies, as well as New England. Between the years of 1652 to 1659 it is estimated that well over 50,000 men, women, and children of Irish descent were forcibly transported to British imperial colonies to serve as indentured labor. Unlike black slaves, the servitude of indentured Irish was limited to a finite period of time, usually about seven years, as “payment” for passage to the colonies. 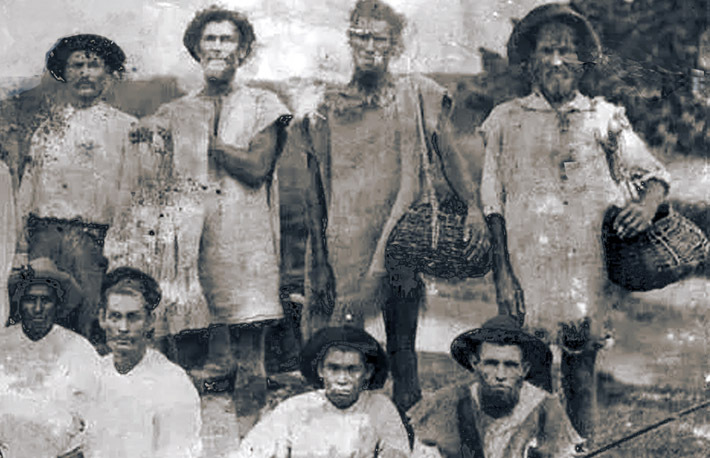 This is believed to be an early 19th Century photo of black and Irish slaves in Barbados. The land and marsh on the east side of Labour-in-vain Creek, extending to Northgate Road were bequeathed to John Winthrop in 1634. In 1637, Winthrop conveyed the land to Samuel Symonds, who became Town Clerk, served as a Judge, and later became Deputy-Governor of the Colony. The property today is known as Argilla Farm. Eleven-year-old Philip Welch was kidnapped from his bed in Ireland in 1654 by Captain George Dell of Salem. He and another Irish boy, William Downing, were loaded onto the ship Goodfellow with Irish women and children destined for New England. Samuel Symonds bought William Downing and Phillip Welch from Captain Dell, who signed over William to nine years and Philip for eleven. After working on Symonds’ farm for seven years they refused to continue working and demanded their freedom. Judge Symonds had them arrested and brought to trial. The proceedings are recorded in the Records and files of the Quarterly Courts of Essex County, Massachusetts, Vol II. That he had about ten acres of Indian corn to be tended and had to hire divers workmen; that during all this court time, his two servants, being all the men he had, were not working, and consequently all his cattle, fence and family were left destitute; that the bargain made between George Dell, the shipmaster, and the plaintiff was still in force, etc. Whereas in the writing above mentioned there was a proviso for good assurance, and seeing that the younger youth in the said writing is called Edward, and that upon his arrival at Ipswich such as do well understand his language do say he owned his name to be Philip, And whereas divers English are put out apprentices who at the end of their term are older than he will be; and for encouragement of his master in teaching him what he conceive may do him good, and that it will be time soon enough to go out of service & betake himself to manage a family, It is agreed between the aforesaid George Dell and Mr. Samuel Symonds as followeth: That two years more are added to the Term of the said Philip who in the writing above is called Edward Welch which maketh it eleven years from the day of the date thereof; And the said Samuel doth hereby accept of both the said youths as having good assurance.” Signed by George Dell. Witness: Joseph Sweet and George Manning, 17th of May, 1654. John King deposed that he with diverse others were stolen in Ireland, by some of ye English soldiers, in ye night out of their beds & brought to Mr. Dell’s ship, where the boat lay ready to receive them, & in the way as they went, some others they took with them against their Consents, & brought them aboard ye said ship, where there were divers others of their Countrymen, weeping and crying, because they were stolen from their friends, they all declaring ye same, & amongst ye rest were these two men, William Downey & Philip Welch, and there they were kept, until upon a Lord’s Day morning, ye Master set sail, and left some of his water & vessels behind for haste, as I understood.” Sworn in court, April 26, 1661, before Hilliard Veren, cleric. Naomi Hull, aged twenty years and upward, deposed that one night before her master Symonds’ servants, William and Philip, were arrested by the constable, they came into the parlor to prayer with the rest of the family, and Philip asked if Goodman Bragg’s son was coming to plow tomorrow. Her mistress said she thought so, that he said he would consider it. Philip then asked who would plow with him and her mistress said, “One of you.” Philip said, ” We will work with you, or for you, no longer. Then said my master, “Is it so? What will you play?” Then both of them stood & expressed that it was so, & that they had been with you (speaking to my master) long enough: “We have served you seven years; we think that is long enough.” Then said my Master, “But we must not be our own Judges.” and said my Master, “You must work for me still, unless you run away.” Then said William, “We scorn to run away.” Then said Phillip, “We will go away, & leave you before your faces.” Also they did both speak to this purpose: “If you will free us, we will plant your corn, & mend your fences, & if you will pay us as other men, but we will not work with you upon the same terms, or conditions as before.” (And this was upon Mrs. Lake her asking of them why they would offer at such a time to go away, mentioning some words how my master’s business did lye, having also said, “Let them alone; now they are speaking, let them speak their own minds.” Whereupon they answered as before. When my master had said “Come let us go to prayer,” Philip said “You may go to prayer; we will speak more in the morning.” And towards the end of ye discourse upon some occasion or question both answered & said it is so, it is so, they appearing resolute to leave my master, as they had said. In the morning when the constable was at my master’s house (about the arrest) motion was made by the constable, or one that was with him, tending to persuade my master to let them alone, saying, “Surely they will go on in your business.” My master answered, “No, unless they be secured.” Sworn, June 15, 1661, before Daniel Denison. Mrs. Margaret Lake testified to the same, and also that Philip said in the morning that if his master would give him as good a portion as any of his children, he would serve out his time. Sworn, 15/6/1661, before Daniel Denison. Martha Trotter testified the same as Naomi Hull, and also that one of the Irishmen said one night that they would stay no longer unless their master showed them some other grounds. She heard Philip say to his mistress that now they had served seven years, they were under no authority of the country, etc. Sworn before Daniel Denison. Ralph Dix, Richard Nicholls and Samuel Younglove deposed that they went with the constable of Ipswich, when he served the warrant on the two Irishmen, and that one of the latter asked to see by what authority he kept them. Mr. Symonds said if the constable would stay he would see, and he produced a writing, which, he said, was all he had to show for them. Sworn, 23/6/1661, before Daniel Denison. Verdict of the jury: In the case of Samuel Symonds, gentleman V. William Downing and Phillip Welch, his two servant: That if Mr. Dell’s covenant be legal, they found service due said Symonds until March 10, 1663; if not, they found for the defendants. Decision of the Court (magistrates): Adjudged the covenant legal, and ordered said Downing and Welch to serve their master until that date. The case was appealed to the Court of Assistants, but giving no bonds to prosecute, upon agreement of all parties, Welch and Downing were to serve Mr. Symonds until the next session of the Court of Assistants, and the latter was to allow them liberty to attend that court. The defendants promised to serve their master faithfully until the next court. William Downing continued to live in Ipswich, and appeared in court over the years both as a plaintiff and a defendant. Philip Welch married Hannah Haggett and soon after removed to Topsfield, where several of their children were born. He died in Ipswich, date unknown. Samuel Symonds served as a selectman, feoffee, and town clerk in Ipswich. He served as deputy assistant to the General Court from 1643 to 1673, when he became Deputy Governor until his death in 1678. Recently discovered Samuel Symonds is my 10th great-grandfather. Interesting article. Do you know who is pictured? I was hoping one might be my ancestor, Philip Welch.